Info "Treasure falling from the sky?! Better grab it all!" Rain of Riches is one of Wario-Man's microgames in WarioWare: Twisted! 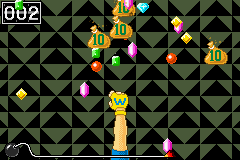 Using the Game Boy Advance's tilting ability, the player must use the hand to catch as much treasure as they can. Level 1: The player must catch 10 gems. Level 2: The player must catch 20 gems. Level 3: The player must catch 30 gems.